Galerie m Bochum is pleased to present from February 20 to April 22, 2015, drawings from the series uaul selvadi by the Swiss artist Evelina Cajacob. The artist has specially designed the color scheme for the exhibition space in which the delicate works on paper are on view. 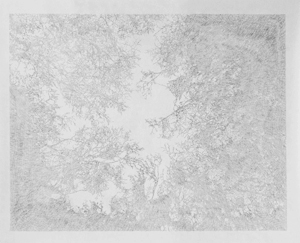 The drawings from the series uaul selvadi show a delicate pattern of branches, leaves and tree trunks. This vegetation is viewed from underneath, the view directed upwards towards the sky. Seen up close, the pictures reveal short individual strokes casting a filigree network over the leaves. From a distance, these fine lines then converge to form an astonishingly sculptural and detailed view of nature. 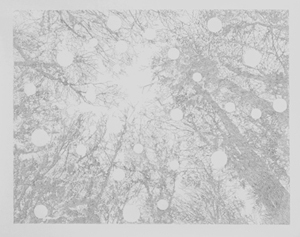 The light gray of the drawings is interrupted by white spaces and circles – areas the artist omitted in the drawing process. Plasticity and emptiness are thus juxtaposed here in a tension-charged contrast between the painstakingly executed areas of the drawing and the blank areas. What at first seems like a true-to-nature representation inevitably takes a turn toward the dreamlike and unreal. The drawings are the result of a long process of development. The artist used as her models photographs she took in the woods more or less at random in 2013. When she came across them again later, they sparked what would turn out to be an intensive re-examination. At first Cajacob experimented with editing the images on the computer, deleting sections and changing the colors. In parallel, she kept making sketches from the photographs. In the works in her series uaul selvadi, which means “primeval forest” in the Rhaetian language, Evelina Cajacob is preoccupied mainly with processes of generation, movement and decay.